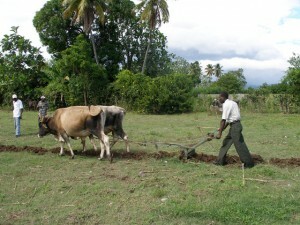 Home AJWS Blog Does Bill Clinton Really Want to Help Haiti for the Long-Term? Does Bill Clinton Really Want to Help Haiti for the Long-Term? Bill Clinton was back in Haiti last week, echoing a major concern of many in the international development community that the upcoming hurricane season poses a huge threat to the country. In addition to nearly a million people living in fragile temporary shelters in the large cities, the agricultural infrastructure in rural areas — already severely damaged — could be completely blown out by even a minor hurricane. He again spoke of his concern that Haiti’s population remains dependent on foreign aid. He has pledged $2 million from his foundation, half for disaster preparedness and the other half to the Haiti Reconstruction Commission (IHRC). If Clinton really is serious about weaning Haiti off international aid, he should think hard about insisting that this money be directed to local groups such as Lambi Fund, which helps strengthen Haiti’s capacity to produce food for itself through initiatives like seed banks. Furthermore, he should insist that community leaders be invited to participate in IHRC decision-making. As we recently pointed out, Haitians and local NGOs need more of a say in matters where they have both unrivaled expertise and a major stake in the outcome. The truth is that $2 million, while helpful, is a drop in the bucket compared to the $2.8 billion we are expecting congress to soon appropriate for Haiti’s reconstruction.